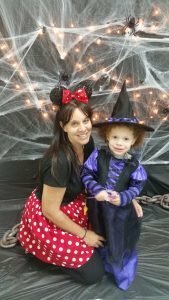 I love planning parties for kids! In the age of selfies and social media, what’s a party without a place to take great photos! Halloween parties are my favorite to plan, between the creepy food, games and costumes, it’s a guaranteed great time. This spooky Halloween photo booth will be a great addition to your party. It can be used at kids and adult parties. It’s so easy to make and everyone will be impressed on how professional it looks. The supplies are easy to find. So, what are you waiting for? Follow the step-by-step directions below to make your very own spooky photo booth. Step 1: Using the packing tape, tape 2 of the black table cloths vertically on the wall. Step 2: Take your lights and tack them in a zig zag design onto the wall over the tablecloth. 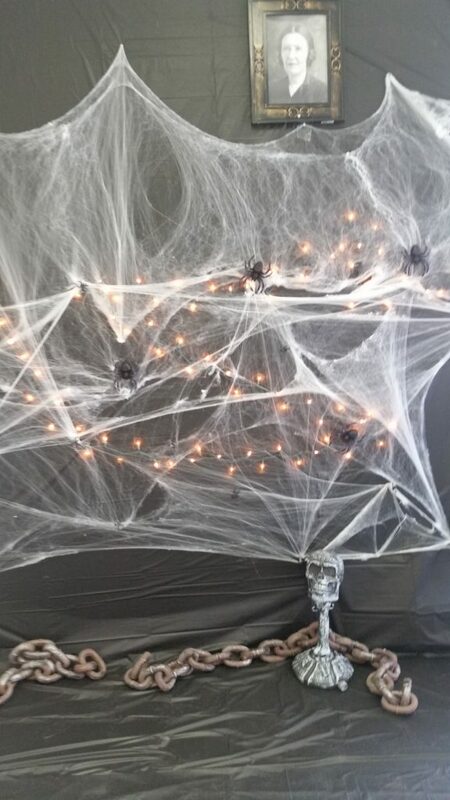 Step 3: Spread out your spider web and place if over the lights. You can use the same thumb tacks that are already in place for the lights. If you are like me, you want to use a minimal amount of tacks in your wall. If you don’t want to use tacks at all, you can check out Command products to hang items without tacks (Command products are available at Wal-Mart, Amazon, Target and most hardware stores) . Step 4: Place your spiders in your web. Step 5: Fold the 3rd black tablecloth in half and tape it to the floor. Step 6: This step is optional, add your spooky Halloween props.